The 3rd annual Functional Skills Prom for area high school Functional Skills classes was held on Thursday, April 17 at Goshen High School. Students from Goshen, Northwood, Concord, Northridge, Fairfield, and Goshen’s Young Adult Program were in attendance. 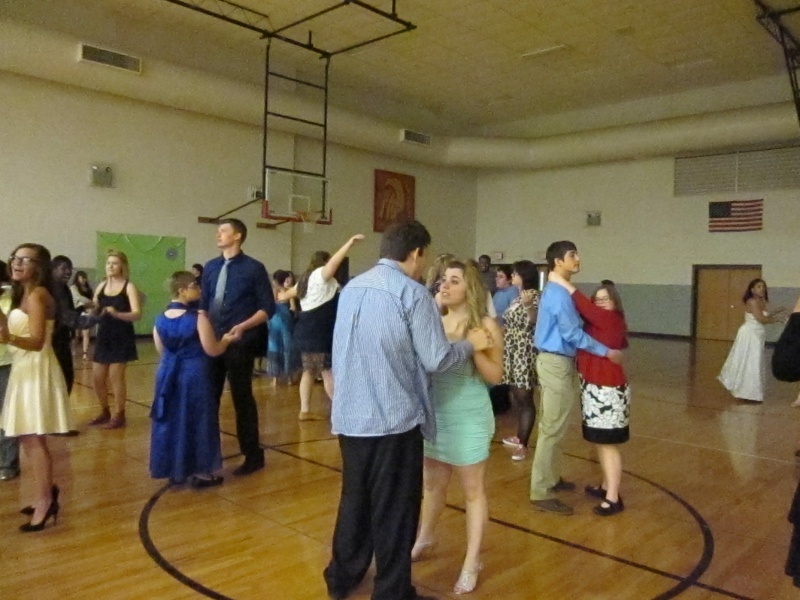 The prom was held in the Whiteman gym at GHS from 11:00 a.m.-1:00 p.m. Members of the GHS student council helped plan, set up and decorate for the event. The RedZone, the GHS bookstore run by marketing students, sponsored the cost of a local DJ for the dance. The cafeteria prepared and catered the meal. A photographer was available to take pictures of individuals, couples, or groups of friends in front of a prepared screen. 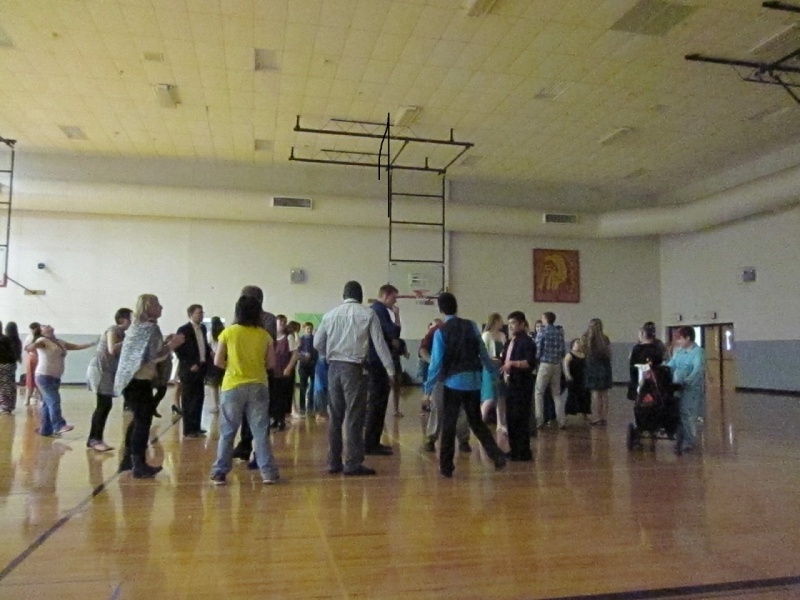 Student council members, members of the swim team, and students who regularly assist functional skills classes in adapted weight training, attended the prom to mingle and dance with their peers. The prom was originally initiated by GHS Functional Skills teacher, Karen Pfahler, and has quickly become a highly anticipated event at GHS. More than 300 Goshen Community Schools students strengthened their musical abilities by participating in area Indiana State School Music Association solo and ensemble contests this past spring. 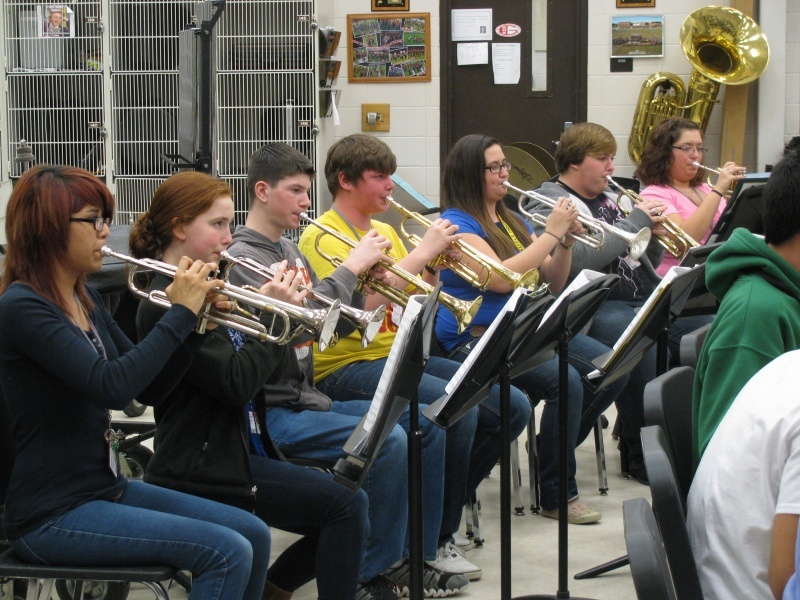 ISSMA’s solo and ensemble programs for orchestra, choir and band students provide a place for students to perform on their own or in a group in a division with students of similar skill levels. Students then receive feedback on their performance from trained judges. The large majority of GHS and GMS students in each category earned golds, with those in the top level of competition going on to state contests. 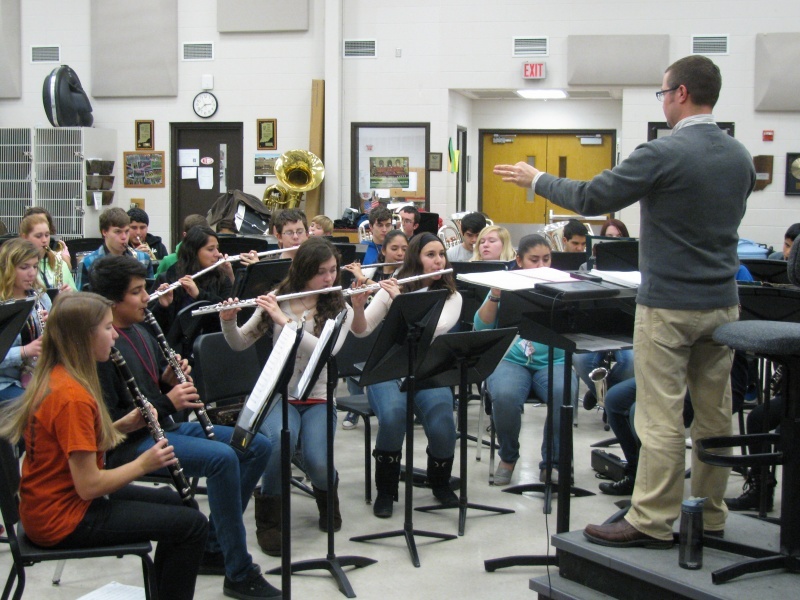 GHS and GMS music faculty help guide the students in perfecting their performances for ISSMA’s solo and ensemble contests, but there’s a culture inside and outside the schools that help students thrive musically. Goshen Middle School orchestra director Sean Patrick noted that there are more than 100 orchestra students at GMS and GHS that take private lessons. GCS teachers can help connect students with quality private instructors. her education at IU-Kokomo. Deja is the daughter of Alfreddie Felder and Rebecca Yoder of Goshen. into a consistent winning program. where she will have her independence”. their athletic program 3 years ago. This will be the first year of Women’s Basketball. Men’s basketball coach at the school. Coach Farris notes, “I am excited about Deja. GHS Coach Lenny Krebs adds, “IU Kokomo is getting a player whose best days are ahead. 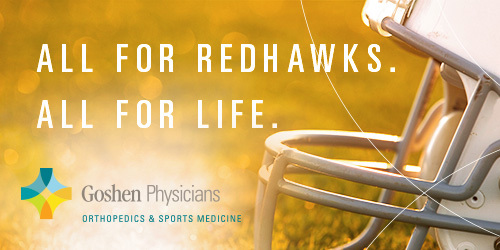 The physicals are done by appointment only. When scheduling the appointment, you must provide full payment and complete the health history on the IHSAA athletic physical form. Appointments will run from 5:30 – 8 PM. C Baseball: Tonight, April 15th, the c-team baseball game against Plymouth is postponed to tomorrow, April 16th. The game will be played at Rogers Park and the start time is 5:00 pm. Golf: The golf match against Northridge and Fairfield has been rescheduled to Tuesday, April 22nd. The golf match will be played at Timber Ridge and the start time is 4:30 pm. Varsity Baseball: On Thursday, April 17th the varsity baseball team will play DeKalb at Phend Field. The start time is at 5:15. Girls Track: Tomorrow, April 15th the girls track meet against Plymouth and Wawasee has been postponed to Wednesday, April 16th at Goshen High School. That start time is 5:00 pm. Golf: Tonight, April 14th, the golf match against Northridge and Fairfield has been postponed. The make-up date is undetermined at this time. Tennis: Tonight, April 14th, the tennis match against John Adams has been postponed to Monday, April 21st. The match will start at 4:45 and will be played at GMS tennis courts. Varsity Baseball Postponed: Tonight, April 14th, the varsity baseball game against West Noble has been postponed. The make-up date is undetermined at this time. JV Baseball Postponed: Tonight, April 14th, the JV baseball game against West Noble has been postponed. The make up date is undetermined at this time. Girls Track: Today, April 3rd, the girls track meet against Lakeland has been postponed to Thursday, May 1st at Lakeland High School. The start time is 5:00 pm. Boys Track: Today, April 3rd, the boys track meet against Lakeland has been postponed to Tuesday, April 22nd at Lakeland High School. The start time is 5:00 pm. Varsity Softball: Today, April 3rd the varsity softball game against Fairfield has been postponed to Tuesday, May 13th at Shanklin Park. The start time is at 5:00 pm. JV Softball: Today, April 3rd, the JV softball game against Fairfield has been postponed to Tuesday, May 13th at Shanklin Park. The JV will start immediately following the varsity. Varsity and JV Baseball: Today, April 3rd the JV and varsity baseball game against Elkhart Central has been postponed to Thursday, April 17th at Elkhart Central. The start time is 4:30 pm. The 72nd annual Goshen Relays boys’ track & field meet sponsored by T-shirt Printing Plus will be hosted at GHS’s Foreman Field on Saturday, 4/26. The field events will begin at 9:00 AM. The 4 x 800 m Relay will begin at 9:15 AM. Track trials will begin at 10:00 AM, with finals starting at noon. Mr. John Dechant is the honorary referee this year’s meet. John will be recognized at 11:45 am along with other event workers and the Relays Queen and court. Goshen High School students and staff raised almost $100, mostly in pocket change, through a fundraiser in February for the Leukemia and Lymphoma Society. The National Honor Society organized the fundraiser, putting out seven collection boxes with the name of a GHS teacher or administrator on each. The person bringing in the most money was to get a whipped cream pie in the face. Every time a student or staff person donated money that person could write his or her name on a slip of paper to be entered for the chance to be the person to put the pie in the face of the teacher. After a week of collecting donations, math teacher Todd Kirkton brought in more than half of the money collected at $54.65 of the total $96.44 donated. 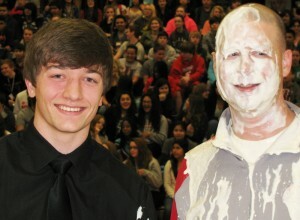 Student David Ambrose’s name was drawn to put the pie in Kirkton’s face in front of the entire school’s population during a pep rally Friday, Feb. 21. While GHS’ National Honor Society organized the event, a GHS marketing class helped promote the event throughout the school. The money went to the Leukemia and Lymphoma Society, which works to fund cutting edge treatments of blood cancer and improve the quality of life for patients and their families.